Hey all. I'm back! Finished with finals and my first year of graduate school. What a relief! Thanks for bearing with my while I have been studying away for the past two weeks. The minute I finished my finals on Friday, I got on an airplane to come down to Charleston--the absolute best place to decompress. Two of W and I's dearest friends were married over the weekend, and the wedding was beautiful--Congrats C & K! As I have been in Charleston over the weekend, I have been thinking a lot about sun rooms. The weather here in Charleston has been so gorgeous over the weekend, however, sometimes when the wind is blowing from the north, the sun doesn't feel as warm. 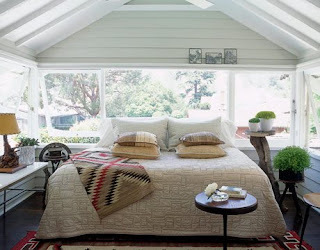 I keep thinking how great it would be to curl up with a book in a room thats wall to wall windows. I love the windows in this kitchen, can't you just see curling up on that couch in the sun? How about a meal on a sun porch like this? I just love the banquette seating with all the pillows. What's great about this, is that you can get that outdoor feeling on sunny and rainy days. 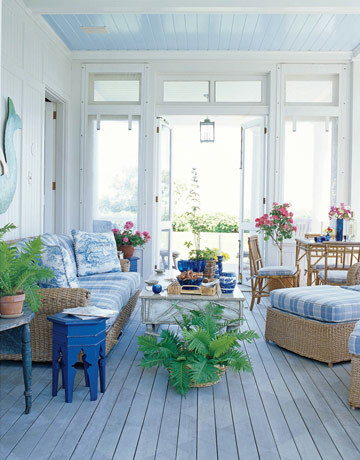 I have shown this picture before--I just love this sun porch on Martha's Vineyard. The blue and white colors, the bamboo and rattan furniture, its beautiful. A great place to spend time on those windy Vineyard days. 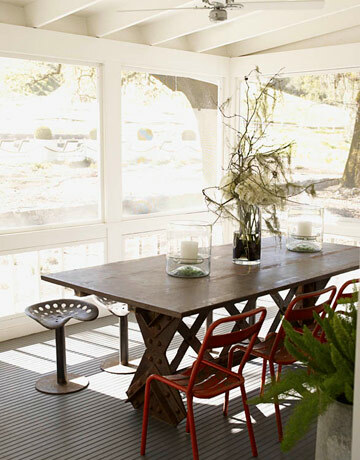 I love the rustic feeling of this sun porch in Napa Valley. This sun room in Greenwich has a really "finished" feeling, and feels less like and extension of the outdoors--more of a morning room. However, I can just feel the warmth of the sun on that banquette seating. Another picture that you all have seen before. I think this is one of my favorite porches. I love the painted floors, french doors, and screens. The furniture is also just perfect for the space. Finally, talk about cozy! How about a sleeping porch? Beautiful porches! I just finished renovating my sunporch (finally got the pics up today!) and a couple of these shots were in my inspiration file! I can't tell you how thrilled I am that there are only two things in all these shots make me think, "Oh, I should have..." 1) Shiny paint on the ceiling! 2) Those curtains in shot 5! I love the one with the zebra rug that leads out from the kitchen. I just helped my dad astro turf the porch and with modern furniture its surprisingly quite kitschy-chic. Great blog, I linked you to mine. 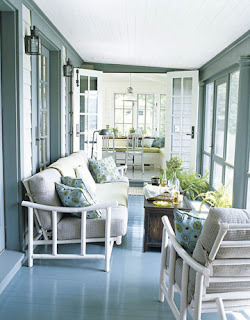 I am in LOVE with the porch with the painted floor. any idea where the white bamboo furniture came from?